Like most common names, "Golden Spinner" can refer to more than one taxon. 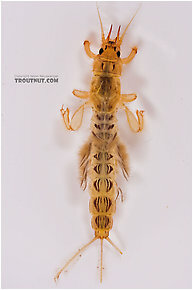 They're previewed below, along with 4 specimens. For more detail click through to the scientific names. These are sometimes called Golden Spinners. These are very rarely called Golden Spinners. This is the only Eastern species of Cinygmula. 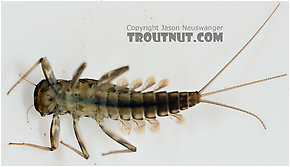 It may produce fishable hatches in places but it is not a generally important mayfly. Cinygmula subaequalis (Small Gordon Quill) Mayfly Nymph View 10 PicturesThis nymph is missing a few gills, but is otherwise in good shape. It was the only one of its species which turned up in my sample. This is an excellent hatch of a different character than its Ephemera brethren. Rather than emerging in a flurry of activity within a week, the Ephemera varia flies may last for more than a month in a single place. 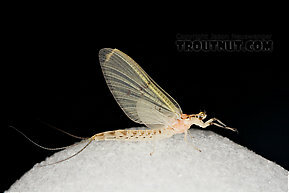 Female Ephemera varia (Yellow Drake) Mayfly Dun View 7 PicturesThis yellow drake dun hatched out of my aquarium over a month before her brethren in the wild are slated to emerge. She seems a bit small, and that might be the reason. 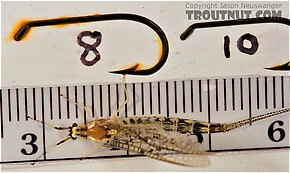 Female Ephemera varia (Yellow Drake) Mayfly Spinner View 6 PicturesI found this female spinner ovipositing in a small stream. She came along while I was playing a trout -- every good bug seemed to do that last night! I didn't have my bug net, so I caught the trout in my landing net, released the trout, and caught the mayfly in my landing net. Her wing got a bit messed up from that.